Arlington Transit could soon add a new bus route to better connect Ballston to Shirlington, as part of a host of route and schedule changes on tap for this winter. The county’s bus service is currently collecting community feedback on the service tweaks, with plans to finalize any changes by mid-December. 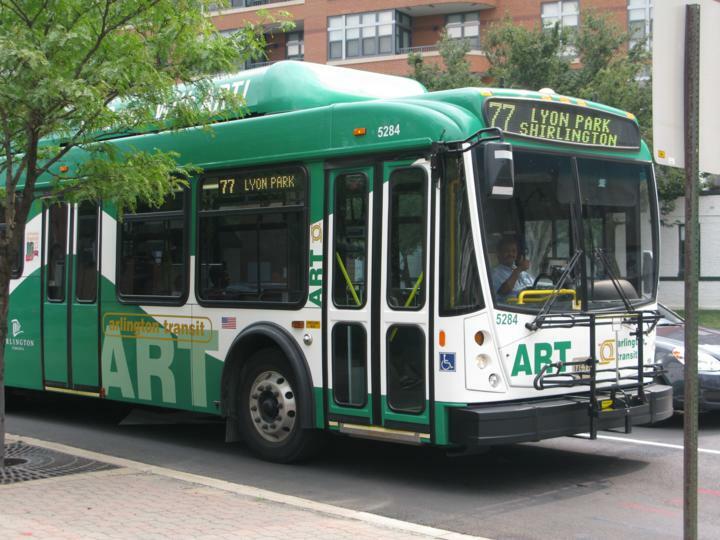 The most substantial of the proposed options would be the creation of a new ART route 72, running from N. Glebe Road’s intersection with Old Dominion Drive in Rock Spring to the intersection of S. Quincy Street and S. Randolph Street near the Village at Shirlington. Stop 2 – N. Glebe Road and 32nd Street N.
Stop 5 – N. Glebe Road and 35th Road N.
Stop 6 – N. Glebe Road and 33rd Road N.
Other proposed service tweaks include running buses more frequently along the 45 route during peak hours, and reducing some service on the 52, 55 and 77 lines. ART would also tweak the schedules of 74, 84, and 87 routes to create better spacing between various buses and endure buses run on time more frequently. The county is currently collecting feedback via an online survey, and will also hold a pair of public meetings on the subject this month. One is set for this coming Tuesday, Oct. 9, at the Arlington Mill Community Center (909 S. Dinwiddie Street), while the other is scheduled for the Langston Brown Community Center (2121 N. Culpeper Street) on Oct. 11. Both will run from 6:30-8 p.m.